A 40-strong team of keen cyclists from BT are using pedal power to raise money for charity. Their cycling challenge will take them on a 30-mile round trip along the North Coast, starting and finishing at the Scenic Inn in Ballymoney on Thursday 28th June. It's hoped the charity cycle ride will raise around £6,000 for Marie Curie. 100 members of BT staff, friends and family are turning their Belfast office into a Soccer Aid pledge centre on Sunday 10th June in aid of Unicef. They've volunteered to answer calls, whilst two star-studded teams – Robbie William’s England and Usain Bolt’s World XI - battle it out on the pitch. So, if you make a donation by phone, there’s a sporting chance your call will be answered in Belfast. If you’re planning to donate money to Sport Relief during Friday’s telethon, there’s a sporting chance your call might be answered in Dundee. Around 100 big-hearted BT and EE staff are turning their offices at Telephone House in Ward Road into a Sport Relief pledge centre, taking it in turns to answer calls after giving up their Friday evening. 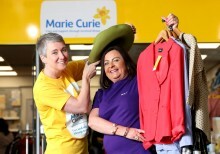 BT’s annual all-island charity shop takeover, BT Shop for Change, has raised an astounding £198,000 for Marie Curie and the Irish Cancer Society - bringing the total funds raised over the last six years to more than £600,000.